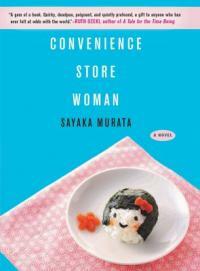 one of my favorite books of 2018 submitted by spostjacobs on June 27, 2018, 10:31am Convenience Store Woman asks the perennial question of what constitutes a happy & fulfilling life (and who gets to decide) in interesting ways. The main character Keiko Furukura has been working in the same convenience store for 18 years, since she was a university student. Social interactions have always confused Keiko, and the routine that is part of her job gives her a sense of purpose. Her status as an unmarried, childless woman with a non-career track job has begun to make her family & friends feel as though they need to "fix" her (we can all guess their recommended "remedies). This tension allows author Sayaka Murata to critique societal conformance, but the novel never feels weighted down. Murata perfectly evokes the neon comfort of the convenience store and the self-contained world of working in any corporate store. Slim and sly, a great read! submitted by Lucy S on July 3, 2018, 10:24am Keiko seems rigid and set in her ways to say the least, but is actually incredibly perceptive about other people. 18 years of carefully observing the habits and patterns of customers in a convenience store has given her an ability to read people. As Keiko lacks subtlety, the story she tells in this slim book is funny and sly, a subversive look at the expectations for women of a certain age and the unquestioned conventions of society.